Now, some may disagree on exactly what comprises a "Shepherd's Pie." I say that it's a meat pie with a pastry crust and mashed potato topping, simply because that's how they're sold as fast food in Australia. Even if wikipedia disagrees. 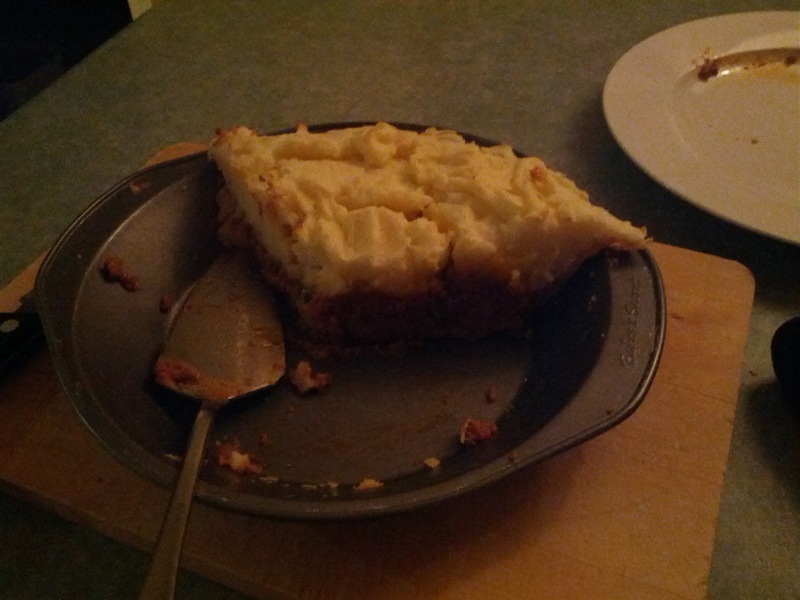 Either way, I made a damn tasty pie on the weekend that had a shortcrust base, tasty minced beef filling and potato top. I simmered all that for about an hour. The crust was made as usual and the mash was a few large potatoes with some milk, butter and an egg yolk mashed through until creamy. I made the mistake of making too much mash and it was too thick on the top. The optimum amount of mash would be about half the thickness of the filling. No more than the thickness of the filling, otherwise the flavour of the filling has to fight with too much potato. Also, when spreading the mash on make sure you start at the edge and make a reasonably good seal before moving towards the center. Don't press hard - you want a good low filling on the side or it might bubble through the sides quite unattractively. I think this recipe wins the prize for being the most vague, but this pie can really just be made up with whatever you like in it. I'm afraid I have to declare pie-atus for another two weeks as I'm being sent to Jersey for work and will be away from the pie kitchen for both weekends.